How to drive a transistor into hard saturation? In using a transistor to operate as a switch you must drive it into saturation. Saturation happens when the collector current cannot further increase despite there is base current increase. The saturation level of every transistor varies. The usual range is from 0.7V to ideally zero. For instance for a BC817-25 transistor, the specified maximum VCEsat in the table below is 0.7V. What happened if the circuit VCEsat is 0.8V? Basically we can consider that the circuit is in linear operating region based from the table below. Now, if you are going to design a switch are you going to design it to operate at 0.7V or in the maximum saturation voltage? It is not a good idea. With tolerances take effect and other factors, the design may come out of saturation. Therefore you need to aim for hard saturation. It is not difficult how to drive a transistor into hard saturation. The easiest way is to use below criteria. Beta circuit is the computed ratio of the collector to base current of the circuit considering the circuit operates at saturation. You have to initially assumes saturation. If the criteria result is true, the circuit is operating at hard saturation indeed. If the result is false, it is not operating in the hard saturation or may be it will operate in the linear region. Beta device minimum on the other hand is the current gain provided by the datasheet of the transistor. To make this clear, let us consider below circuit as example. This is a simple and most of the time used switch configuration for low side small signal driving. For BC817-25, the minimum device beta is 160 as indicated in the table below. Let us consider VBE value of 0.7V typical. The computed ratio of collector to base current is very very small compared to the minimum beta of the device. No doubt the circuit will enter hard saturation. 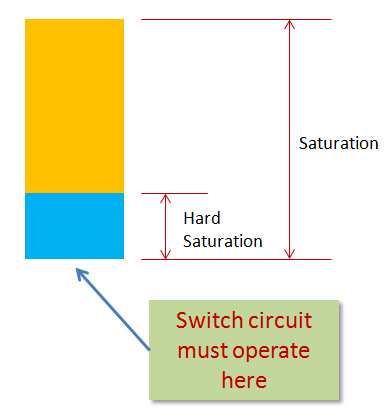 What is the Reference Beta for the Circuit to Consider Operating at Hard Saturation? By only saying that the circuit beta must be very less than the minimum beta of the device; still there is argument. Transistor datasheets most of the times do not include hard saturation beta reference. 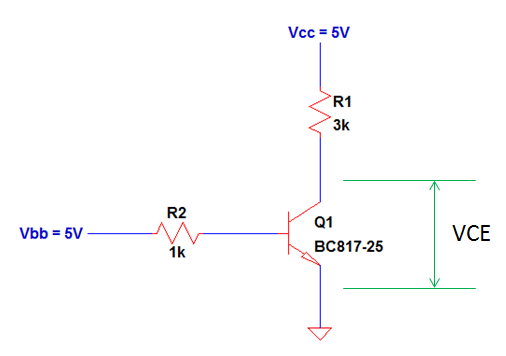 However, based on long experience in circuit design, a circuit will surely operates in hard saturation when the ratio of collector to base current is 10. The smaller the better. It will not increase the BOM cost anyway. Dieser Lymphknoten kann unter der Operation mittels einer Spezialmesssonde aufgesucht werden.